What is the blood moon tetrad from a scientific perspective? Is it possible that God is truly giving us a divine warning through the blood moon tetrad of 2014-2015? If so, is His message specifically for Israel? For other nations/groups of the world, including Muslims? What is the view shared by Mark Biltz and John Hagee, two of renown, in this specific area? Is there any significance to Jewish and Muslim Sequential Feast Days? September – October is a period of several feast/holy days for the Jews and also the Muslims. Is it coincidence that the blood moon tetrad happens to fall in the middle of these high days, each for two people groups historically at enmity with one another? What are the primary Scriptures on blood moon prophecy? Where can we each look to find God’s direction in this very important and relevant area for us all? What are some problems with the Biltz and Hagee views? Are they stretching the Scriptures or are their views on solid ground? What questions might the Islamic paradigm raise that are unique to this astronomical event? If you think about it, both Jews and Muslims are on a lunar calendar. Perhaps the blood moon tetrad has just as much to say to Islam as it does to the Jews– or the world! The trigger for the end – They have divided my land. The action starts on April 15th  when the full Moon passes through the amber shadow of Earth, producing a midnight eclipse visible across North America. So begins a lunar eclipse tetrad—a series of 4 consecutive total eclipses occurring at approximately six month intervals. The total eclipse of April 15, 2014, will be followed by another on Oct. 8, 2014, and another on April 4, 2015, and another on Sept. 28 2015. 1492 – The Spanish Inquisition forced Jews to convert to Catholicism or face death or expulsion. The Inquisition sought to eliminate “crypto-Jews,” those who pretended to have converted to Christianity but really had not. On March 31, 1492, King Ferdinand II and Queen Isabella I signed the Alhambra Decree (Edict of Expulsion), expelling all Jews from Spain unless they converted to Roman Catholicism. Biltz connects the blood moon tetrad with the Spanish Inquisition. He connects the forfeiture of property by the Jews as the means of funding Christopher Columbus’ trip to America. Hagee interprets the purpose of Columbus’ voyage as providing transport for the expelled Jews to America, along with the seizure of property to finance the voyage. He then brings America in the prophecy apparently because Jews were brought to America by Columbus. According to NASA , the blood moon tetrad occurred over the two years, 1493 – 1494. 1948 – The United Nations Partition Plan brought the British Mandate to a close and established geographical boundaries for a Jewish State and an Arab State. The Plan was never signed by the Arab nations. On May 14, 1948, Israel declared itself an independent Jewish State. On May 15, 1948, the Arab-Israeli War of 1948 began. Israel was successful in defeating the Arabs in the war and signed the 1949 Armistice Agreement with its Arab neighbors, Egypt, Syria, Lebanon, and Jordan, over the first six-months of 1949. According to NASA, a blood moon tetrad occurred over the years 1949 – 1950. 1967 – The Six-Day War was fought by Arab – Israeli forces between June 5 – 10, 1967. Israel miraculously defeated the Arabs, and literally tripled the land area under its control, the most significant of which was gaining control of East Jerusalem, comprising the holy sites, i. e., the Temple Mount. According to NASA, the blood moon tetrad occurred over the years 1967 – 1968. Is it possible that God is not speaking about Israel as much as He is to those are at enmity with Israel? Both Judaism and Islam are on lunar calendars. Just as Judaism has a significant 7th month with feast/holy days, so does Islam. Perhaps our interpretation should focus on the sons of Ishmael rather than the sons of Jacob? 4. Allowing the Scripture to Speak. There are three primary passages in Scripture to interpret blood moons: Joel 2:30-31, Acts 2:17-21), and Revelation 6:12-17. The context of Joel 2:30-31 is God’s promise of the Holy Spirit poured out upon all mankind (Joel 2:28). The New Testament points to the time of fulfillment at Pentecost since Simon Peter quotes the Joel 2 passage, at Pentecost, as “tongues of fire” (Acts 2:3) rest upon the disciples, and they speak in tongues, i.e., their words understood by all nationalities present (Acts 2:8-9). The Acts 2 event occurred on the Jewish festival, “Shavuot, (Feast of Weeks, Exodus 34:22, and there described as a celebration of the first fruits of the harvest), known as “Pentecost” from the Greek word for “fifty,” celebrated fifty days after the 1st day of Passover to commemorate God’s giving the Ten Commandments at Mount Sinai (not explicit in Scripture but from the Jewish Rabbinical laws). There seems to be little question that Scripture notes the presence of blood and moon together “before the great and awesome day of hte Lord.” However, there is no mention of Biblical feast days as a primary correlating factor in any of the passages. Biltz and Hagee answer this by pointing to Genesis 1:14 which points to God’s use of the heavens as “signs and seasons and days and years” (“Divine billboards” per Hagee). The Hebrew word translated as “seasons” is “moed” which BDB Lexicon states, in part, “a) …sacred season, … set feast or appointed season (…which was only a feast celebrated by a pilgrimage), and b)”It is most probable that in Gen 1:14 (P), where … the reference is to the sacred seasons as fixed by moon’s appearance; and so also … he made the moon for sacred seasons. Psalm 104:19 .” Thus, they interpret “seasons” as the appointed feast times when the moon will turn to blood to mark the day of the Lord. 5. Some problems with Biltz and Hagee’s interpretation. A. The blood moon tetrad is not supernatural. In the three Scriptures, the phrase “moon turned into blood” is surrounded by characteristics typical of supernatural events, i.e., events that defy the physics of God. Words and phrases such as “wonders” (Joel 2:30), “stars falling to the earth like figs,” and “sky split apart” (Revelation 6:13-14) are present. Very important to interpreting Joel 2:30-31 is an earlier verse that sets the context, Joel 2:10, which states, “Before them the earth quakes, The heavens tremble, The sun and the moon grow dark And the stars lose their brightness.” These are all simultaneous requirements that only God can orchestrate. When four consecutive lunar eclipses occur between 2014 -2015, they will do so by God’s previous design; and, on September 28, 2015, we will only find fulfillment if the sun, moon, and stars are all darkened at the same time, clearly a supernatural occurrence. Otherwise the current blood moon tetrad is not the fulfilling moment described in these passages. The day the sun stood still. Joshua 10:12-13. The day the shadow of the sun went backwards. 2 Kings 20:11. These events are very different from the blood moon tetrad. They are supernatural. They defy God’s natural order. The blood moon tetrad does not defy God’s natural order, it is God’s natural order. According to NASA, there have been 12,064 lunar eclipses in the last 5000 years, of which 3,479 have been total eclipses. Of the total eclipses, there have been 110 tretrads (series of four consecutive total eclipses). NASA can predict precisely when the next tetrad will occur and, of course, if one has a lunar calendar with the future feast days, one could also predict the future tetrads that will fall upon a feast day. Yet, NASA cannot predict when the “sun and moon will go dark and the stars lose their brightness.” (Joel 2:10) Supernatural events can only occur on the timetable of God not the predictability of man. The logical conclusion is this: if the tetrad itself is not supernatural then the alignment of Biblical feasts with it loses its meaning because the Scriptures require a supernatural blood moon not a natural one. B. If a blood moon tetrad occurs after the historical event how can it be a sign from God? The blood moon tetrads of 1492 and 1948 occurred after the historic event that Biltz (and Hagee) offer, not before it. Only one of the four lunar eclipses in 1967 fell before the 1967 Six-Day war. If the tetrads come after, how can they be a sign? 1494: March 22, September 15. 1950: April 2, September 26. Biltz and Hagee offered the Spanish Inquisition as the harbinger for Israel in 1492. They gave the signing of the Edict of Expulsion on March 31, 1492 by Ferdinand and Isabella of Spain, as the specific proof of the devastation to occur to Israel. How can this event be a proof when it came before all four of the lunar eclipses of 1493 – 1494. Signs must come before, not after. Biltz and Hagee offered May 14, 1948, the day Israel declared itself an independent state as the proof. The harbinger, the 1948 Arab-Israeli War, started the next day. The event is almost a year before the 1st lunar eclipse of the 1949-1950 tetrad, April 13, 1949. Biltz goes so far as to describe God giving signs in the “moment,” that is, the day, the hour, so we can recognize the event as from God. Video here. If this were the case, then we should expect the event proving the tetrad of importance to occur on the date of one of the four tetrads or at least before the first of the four lunar eclipses that comprise a tetrad. To suggest the tetrad as God’s divine billboard, inscribed with the wrong date and time, hardly sounds like the God that created the universe and determined the moments in time when the tetrads would occur and the feast days would be celebrated. Why 1492, 1948, and 1967? If the blood moon tetrads combined with feast days are intended by God to be prophetic, we should expect to see tetrads and feast days on the worst days in Israel’s history. After all, what makes 1492, 1948, and 1967 so special considering all the tragic historical events for Israel that God has available to draw from? What would you say is the worst day in the history of the Jewish people? The destruction of Solomon’s Temple by the Babylonians? This occurred on the 9th of Av, 586 B.C. “AV” is the fifth month in the Hebrew lunar calendar and generally the 11th month of the Gregorian calendar. According to NASA, there was no blood moon tetrad in 586 B.C. The second Temple was rebuilt by Herod the Great in 20 B.C. It was destroyed by the Romans on the 9th of Av, 70 A.D. (same day, 595 years later). There was no blood moon tetrad in 70 A.D. Jesus Christ was crucified in 30 A.D. There were no blood moon tetrad in 30 A.D. Lastly, if the expulsion of the Jews in 1492 is so important that a blood moon tetrad is sent to identify it, why wasn’t a similar tetrad sent to identify the expulsion of the Jews from Britain in 1290 A.D. or the expulsion from France in 1306 A.D., or expulsions from Warsaw, Sicily, Lithuania, and Portugal in 1483? According to NASA, there were no such tetrads on any of these dates. C. Is the blood moon tetrad a harbinger for Israel or a blessing for Israel? Why would God use a Jewish feast day to communicate a terrible event for His own people in the first place? Feast days are high holy days– Passover, Pentecost, Feast of Tabernacles, etc., are all festive celebratory occasions, each celebrating some act of God to save, forgive, or deliver His people (only the Day of Atonement is a holy day of fasting and repentance). Even if God intended to prophesy of coming judgement for His people, why use a feast day previously set aside as a sign of blessing to communicate His message? That seems backwards to me. The context of Joel 2:30-31 suggests the same. The blood moons of Joel 2 and 3 are not harbingers for Israel but promises of blessing. Israel is restored to her land, her city, and her fortunes. Joel 3:1, 20-21. The nations that have enslaved her, taken her property, and sold her children, as well as the looted Temple treasures, are now about to be judged. Joel 3:2, 5, 11-14, 19. War is coming –waged by God against Israel’s foes, and the Valley of Jehoshaphat is the appointed place (Read more). Joel 3:9, 16-17, 21. 6. What about the Islamic Paradigm? Let us turn the coin to the other side– and there we find the descendants of Hagar and Ishmael, and a sole mentioned, distant son, Muhammad and his Islam. If we were to consider just the three dates that Biltz and Hagee offer as harbingers to Israel, I would say these same dates are far more catastrophic to the Arabs than to the Jews. 1492. The Spanish Inquisition included an expulsion of Muslims as well as Jews. In fact, the Muslim emirate in Spain had just been defeated in the Reconquest of 1491 by the Spanish armies of Ferdinand and Isabella.The Muslim “Nasrid dynasty was the last Muslim dynasty in Spain, ruling the Emirate of Granada from 1238 until 1492.5 Following his surrender, all Muslims were expelled from Spain over the next century. Forced converts from Islam were called Moriscos. Muslims were expelled primarily to North Africa. Recently (June 11, 2015), the descendants of Jews that were expelled from Spain were granted citizenship in Spain as an apology by the Spanish government for the expulsion in 1492. Muslims were not granted similar rights, and have protested. If the Muslim demands for citizenship were granted, Spain would be the largest concentration of Muslims in Europe. 1948. The tetrad occurred over 1949 – 1950. The United Nations Partition Plan divided Palestine into independent Jewish and an Arab states. The Arabs never recognized the UN Partition Plan or signed it. At midnight on May 14, 1948, the British Mandate expired, and Britain forces were withdrawn. Earlier in the evening, the Jewish People’s Council had gathered at the Tel Aviv Museum, and approved a proclamation, declaring “the establishment of a Jewish state in Eretz Israel, to be known as the State of Israel.” The 1948 Arab–Israeli War began with the invasion of Palestine by the Arab States on May 15, 1948. A combined invasion by Egypt, Jordan and Syria, together with expeditionary forces from Iraq, entered Palestine, to attack Israeli forces. After ten months of fighting, Israel successfully retained the 1948 Partition Plan area; in addition, almost 60% of the area of Arab state proposed by the 1948 Partition Plan, including the “Jaffa, Lydda and Ramle area, Galilee, some parts of the Negev, a wide strip along the Tel-Aviv-Jerusalem road, West Jerusalem, and some territories in the West Bank” were secured. Around 700,000 Palestinian Arabs fled or were expelled from the area that became Israel and have become Palestinian refugees. In the three years following the war, about 700,000 Jews immigrated to Israel with many of them having been expelled from their previous countries of residence in the Middle East.” Thus, what the Palestinians lost, the Jews gained. It is estimated that the Palestinians suffered twice the casualties of the Jews in the war. The 1949 Armistice Agreement signed by Arab nations, Syria, Jordan, Egypt, and Lebanon, with Israel took the first seven months of 1949. Israel gained territories of about one-third more than originally allocated under the UN Partition Plan. Again, what Israel gained, Arabs lost. Muslims annually remember May 15, 1948, the day after Israel declared itself an independent state, and the day the 1948 Arab – Israeli War began, as the “Day of Catastrophe” (Nakba Day). Jews remember the day before as the day God fulfilled His ancient promise of blessing that the Jews would be gathered to their land, a second time (Isaiah 11:11-16), a land they would never experience shame over again. Joel 2:26-27. 1967 Six-Day War. The Six-Day War began on June 5 and ended on June 10, 1967. The dates for this tetrad are: April 24, October 18, 1967; April 13, October 6, 1968. The Six-Day War was over before the second lunar event occurred. The Arab states of Egypt, Jordan, and Syria were soundly defeated in a miraculous victory for Israel. 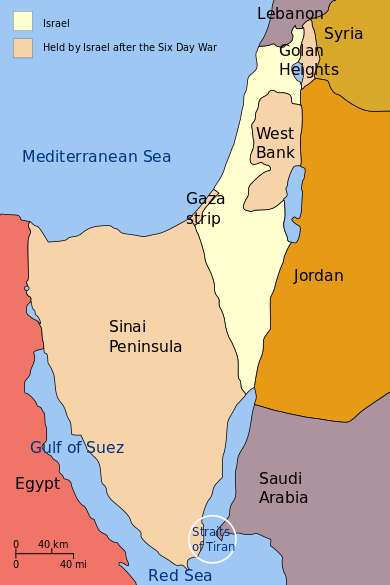 Israel captured the Gaza Strip and the Sinai Peninsula from Egypt, the West Bank (including East Jerusalem) from Jordan, and the Golan Heights from Syria (see tan areas in map). More importantly, East Jerusalem, which includes the Temple Mount and its holy sites, returned to the control of Israel for the first time since the Maccabean Revolt against the Greeks in 163 B.C. Jerusalem remained under the dominion of the Romans until Jerusalem was destroyed in 70 A.D. and again in 135 A.D. The Jews were scattered to the nations until they returned to Zion in 1948. 7. The trigger for the end – They have divided my land. This last point will be brief. Joel 3:2 concludes with a statement that cannot be overlooked: “They have divided my land.” This statement follows verse 1 which describes God’s action of gathering the nations for judgment only after He has restored the fortunes of Judah and Jerusalem (Joel 3:1-2). This means that judgment will occur after May 14, 1948, and also, after 1967, the time when East Jerusalem was gained by the Jews. Thus after 1967, look for fulfillment. The event for fulfillment is the “dividing of My land.” When Israel is forced to divide its land with the Palestinians in a “two-state” solution for the Arab – Israeli problem, judgment will toll. And whomever approves the dividing of the land with the Palestinians will bring itself under the judgment hand of God, and Joel 3, Revelation 6, Matthew 24 and other end-of-days passages of judgment. The blood moon tetrad is not a harbinger for Israel or the world; perhaps, to the Arabs, but still doubtful, in spite of sequential feast days suggesting same. Does that mean we are not fast approaching that point in human history when the United Nations will force Israel to enter treaty with the Palestinians for a “two-state” solution? Absolutely not. We are nearing that time. But don’t look into the sky for a blood red moon to tell you that; just read your news alerts. When we read that the United Nations has passed a resolution to divide Israel’s land with the Palestinians and reverse the decision it made to grant that land in 1948, then the time is upon us. Forget the blood moon tetrad. I’m surprised at you grouping Muslim and Jewish holidays together, since God never instituted or commanded the sons of Allah to keep these Muslim holidays to begin with, but they are of pagan origins: so how on earth could they have any prophetic significance or biblical connection to the Blood moons? Its also more than a little surprising too, that you would ever use Hagee as any sort of reliable source of the blood moon tetrads, or even Spitz, though he did do a fairly decent job-but his setting dates and times is just a canard, and ought to be ignored! Indeed, none of those writing books about the Blood moons whether tetrads or otherwise are Hebrew scholars, which is just why none of them ever mentioned that enormous fact that the Judgments of the blood moons tetrads were instituted under the legal grounds in the Torah. God is thusly legally obligated to warn His people Israel before Judgment can come upon them. Well, sometimes God simply waits! Waits until they decide to do this or not to do this, then He makes His judgment. So things don’t always fall on exact dates…because God’s judgments ARE conditional. When the best seller written by Jonathan Cahn “The Harbinger: the Ancient Mystery that holds the secret of America’s Future” came out, people got themselves into a fevered pitch after the first two judgments fully predicted in his book fell upon America. But, I can tell you right here and now, that nothing is going to happen, nothing whatsoever in the next few weeks, or even months, nothing!! Because, “after the first and second admonition”—-then: comes the Judgment!! And, as I have pointed out on this comment thread before, if America is not the modern day children of the Tribes of Israel, than its utterly impossible for God’s legal judgments instituted especially for His chosen people Israel to ever be applied to America as a nation!! Thanks Servant for your comment. I believe you first advocated Obama as the Antichrist (I may be wrong, so forgive me if my memory is wrong!). Do you still hold to that view? Can you imagine how Trump would fit the defintion of the Antichrist if elected president of U.S.? The internet will go crazy with new prophecies of how America will be the harlot of Rev 17. The only problem to me is that America, although fulfilling 99% of the characteristics of Rev 17, does not fulfill one that is very important. It is not “drunk with the blood of the saints.” America has been a nation for less than 300 years so how could it fulfill an Antichrist prophecy that begins with Rev 12:17? Actually, the point I was making about the Muslim holidays sequential to Jewish holidays was that perhaps there was a message from God there. This seemed more likely when the prior tetrads suggested by Hagee and Biltz were catastrophies for Arabs. In the end, the tetrads were not of significance so neither would a parallel with Jewish holidays. Thought provoking. I appreciate your skepticism toward those who interpret most signs from heavenly bodies as harbingers of disaster. Usually it means people are afraid or they are trying to whip up fear among the gullible. Disciples of Jesus, however, are not at all afraid of anything. “Fear not” said the angel to the lowly shepherds. We know that no matter what happens, our earthly lives are temporary and will fade out of memory when we die and are with the Lord and his saints. 70 A.D. is 656 years after 586 B.C. – not 595. Re. supernatural vs. natural events (as you point out): the moon can look red when it’s low on the horizon on a clear night; and when pollutants or airborne particles from fire or volcanic eruptions block all but light’s red wavelengths from being seen. The moon can look red over a forest fire or a battlefield with a lot of smoke. The sun can be darkened for the same reasons. So (as you say) it’s not necessary to always interpret Bible verses about blood-red moons as evidence of supernatural things. And since lunar and solar eclipses are not seen by people in every country in the world, should non-viewers be bothered? September 28 promises to be a rainy day where I live. I will not see the lunar eclipse. Am I concerned?